Q: What is gypsy moth pheromone? A: Gypsy moth pheromone (pronounced fair-o-moan) is a powerful scent produced by the flightless female moths to attract mates. In the forest, males find their mates by flying upwind to locate the female that is producing the scent. 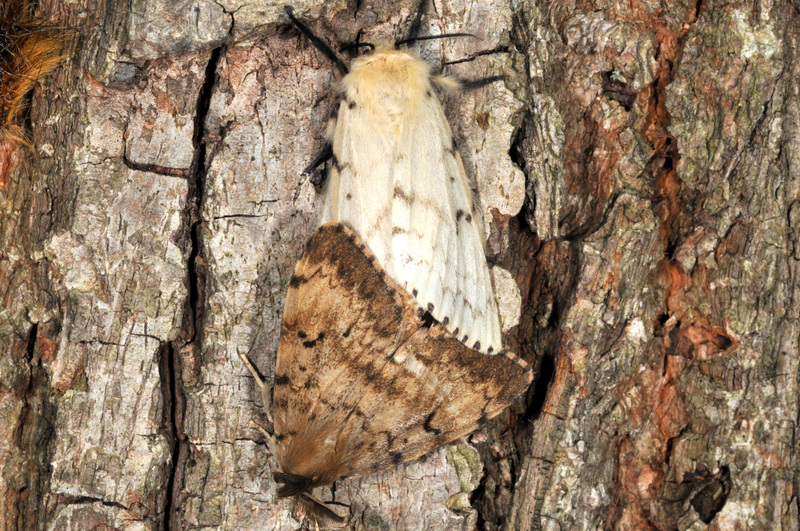 The pheromone is produced commercially for use in gypsy moth detection and control programs. Q: What is the gypsy moth, and why is it a problem? A: The gypsy moth is an insect with a big appetite for oaks. Each caterpillar can grow up to 2 inches long and can consume up to 11 square feet of foliage from early May until June. When abundant, caterpillars can completely defoliate trees. 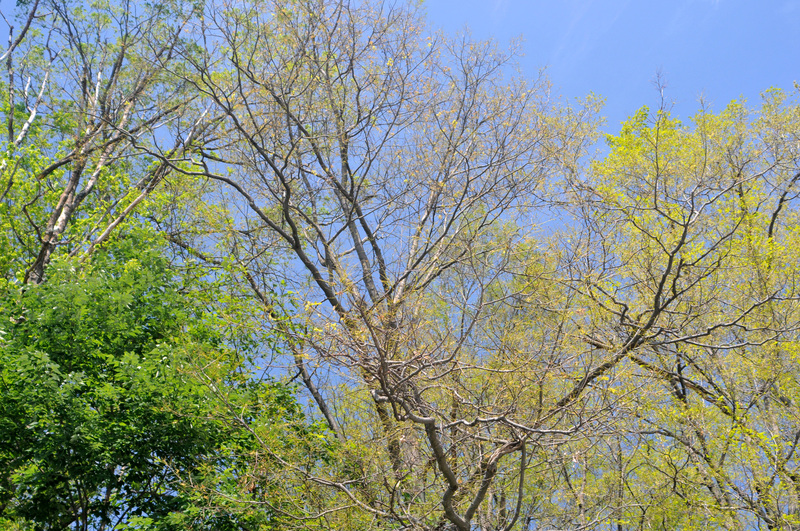 Although healthy trees can survive defoliation, repeated removal of leaves can kill a tree. Older, less vigorous trees suffering from drought can be killed by a single defoliation. Capable of feeding on 500 plants, this pest threatens Indiana forests and suburban landscapes. Gypsy moth caterpillars are also a public nuisance in recreational and residential areas that are known for their oaks. The rain of caterpillars and their excrement from treetops can discourage even the heartiest Hoosiers from taking a walk in the park. Some people develop rashes or allergies to caterpillar hairs that float through the air. Defoliation caused by gypsy moths. Q: Where did the gypsy moth come from? A: The gypsy moth was introduced from Europe to Massachusetts in 1869. Since that time, gypsy moth has been spreading slowly to the west and south. Because adult females cannot fly, most of the gypsy moth spread occurs when young caterpillars crawl to treetops and are blown by the wind. Gypsy moths can be moved long distances when people unknowingly carry them from infested areas as egg masses or cocoons attached to firewood, campers, nursery stock, or other outdoor items. Most of the isolated pockets of infestation that have been located in Indiana are a result of this kind of long-distance movement. Q: How is the pheromone used to slow the progress of the gypsy moth? A: Traps, baited with pheromone, have been used in Indiana to detect and eliminate pockets of these hitchhiking gypsy moths since 1973. They are also used to monitor the natural spread of this insect as it moves through Indiana. Currently, only counties in the northern part of the state are considered infested. When males are found in the traps outside of the infested area, DNR personnel increase trapping intensity to locate the source of the moths and inspect the area for egg masses. Once the moths are detected, decisions are made about how to eliminate the gypsy moths from these isolated areas. Since the beginning of the trapping program, more than a dozen pockets of gypsy moth have been detected, treated, and eliminated in Indiana. Q: How is the pheromone used to control gypsy moth? A: Gypsy moth populations can be suppressed or eliminated when an infested area is laced with enough pheromone to make it impossible for males to find females. Unable to mate, the gypsy moths simply die of old age without producing any offspring. Q: What are pheromone flakes? 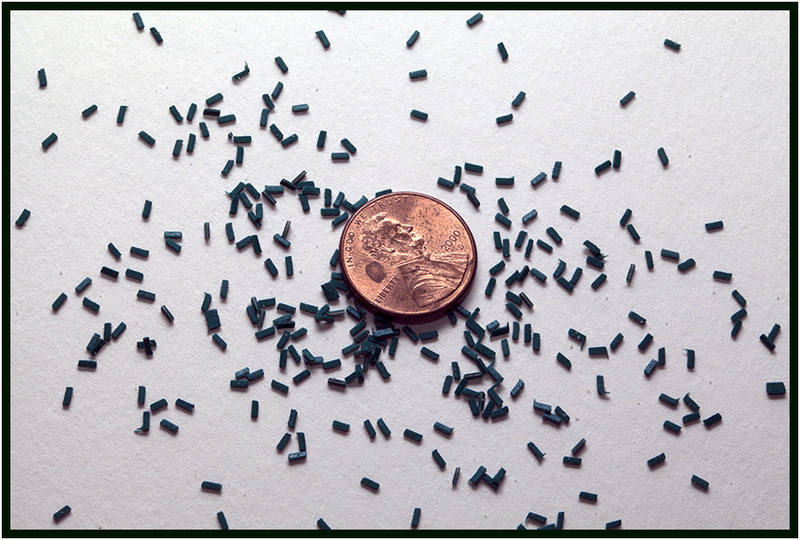 A: Pheromone flakes are tiny bits of plastic that have been treated with pheromone. About one cup of flakes is spread by airplane over each acre of infested forest during late June, just before adult moths would normally mate. Q: Will the pheromone flakes be noticeable in the treatment area? A: No. With only 3 green flakes applied per square foot, they will be hard to find. It takes about 100 flakes to cover an area the size of penny. Pheromone flakes also won’t take finish off your car or your vinyl siding. Even after they were applied over full parking lots at the Indiana Dunes Lakeshore, no complaints were reported. Q: Are pheromone flakes dangerous to people or wildlife? A: No. They are non-toxic to humans and other animals. The pheromone application will only affect gypsy moths. Caterpillars of other moths and butterflies will not be harmed. Pheromone flakes (in relation to size of a penny). Q: If pheromone flakes are so safe, why aren’t they always used to control gypsy moth? A: Pheromone flakes cannot reduce gypsy moth populations in areas that are heavily infested with moths. In these areas there are enough males and females wandering about for them to find each other without the help of pheromones. In contrast, when populations of moths are very low, mating disruption works well and is cost competitive with other treatment methods such as BTk.